If you are looking to do exercises for sacroiliac joint pain then your first focus should be to stabilize your pelvis (hips), including the sacrum, in proper alignment. DO NOT do SI Joint Exercise in poor pelvic alignment, you will only stabilize the faulty posture and cause yourself more problems! Learn neutral spine: Neutral spine exercises for sacroiliac joint pain are the healthiest and most stable position for the spine and pelvis taking in to account the natural curvature of the spine. · Sitting: When sitting in a chair press your bottom right up against the back of the chair then stack the rest of your spine up over it. Feel your ears over shoulders, over your hip bones and your breastbone is should be right over the pubic bone. Navel drawn in gently. Feel space between your ribs and pelvis. Proper posture is the best way to reduce tension from sitting at work all day, on computers, driving, etc. · Lying: Lying on a mat with your knees bent and feet hip width apart. Begin by releasing your tailbone down creating an arc in the lower back, move up into the mid back and draw it down without flattening the spine. Keep your shoulder blades down and heavy and the back of the neck long, do this by drawing your chin down towards your chest leaving the size of a fist space there. · Standing: Back up against a wall with your buttocks and shoulder blades leaning into the wall. 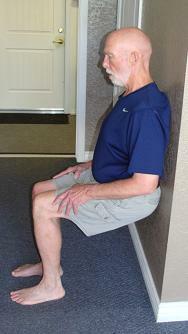 Notice whether your lower back is against the wall or if there is an excessive arch there. The latter is more common. To achieve neutral keep the buttocks and shoulders against the wall and then draw the middle part of your back into the wall. You should feel the abdominal muscles engage and/or the ribs drawing in. Find out more about achieving neutral spine and exercises for sacroiliac joint pain in the new Pilates ebook packed with valuable pictures and detailed descriptions to get you out of pain! Position: Standing in neutral spine and leaning into the wall with your feet the length of your thighs away from the wall. Action: Bend your knees no lower than a 90 degree angle keeping your weight in the heels evenly for both feet. Kneecaps should line up with the second toe in each foot. Repeat for 8-12 repetitions. Do 2-3 sets every other day. Cues: Place your hands on your hip bones and make sure they stay level as you bend and lift, also keep the buttocks, shoulder blades, and mid part of the back against the wall throughout the exercise. Check out the hip stretch on this page to help balance your pelvis and SI Joints. One of my favorites! Position: Lying on your mat with spine in neutral and knees bent. Action: Imagine your pelvis as a clock. 12 o’clock is at your navel, 6 is at your pubic or tailbone, 3 and 9 are the hip bones. Now imagine there is water in that clock or bowl and you are going to empty from 12 o’clock around clockwise and then counterclockwise feeling each number on the clock working. Sometimes it is helpful to place your hands on the pelvis so you feel the movement just there only. 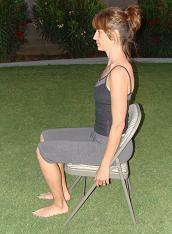 Cues: Keep your knees still so you are just mobilizing the pelvis. Strengthening Exercises for the Sacroiliac Joint Once you have a stable and aligned pelvis you can begin mobilizing exercises to continue strengthening. Position: Lying on the floor with one leg extended along the mat and the other at a 90 degree angle to the floor and a neutral spine. Action: Keeping the pelvis still circle the thigh (leg) in the hip socket 6-8 times each direction. Switch legs. The band around the foot will help to support the weight of the leg. Cues: Focus on keeping the torso and leg on the mat very still as you freely circle the leg in the air. Position: Lying in neutral with knees bent and your arms at your side. Action: Inhale to prepare and exhale as you press into your heels lifting the pelvis up in neutral until weight is between shoulder blades not in the neck. Inhale hold at the top then exhale to bring the tailbone and ribs down all at one time. Repeat for 5 -10 repetitions. Cues: Focus on the navel drawn in to lift the pubic bone up to the ceiling. Weight even in the feet. Note: Rotation and side bending exercises for sacroiliac joint pain can be added as you are symptom free in neutral spine. 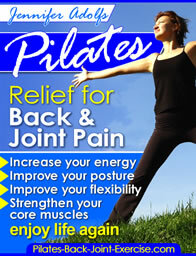 Find more about the hips and SI Joint exercises by going to my hip pages here.